The International Journal of Biological & Developmental Psychology is a peer-reviewed, open access journal that publishes original research papers, review articles, essays, and historical perspectives on developmental psychology and its biological corollaries. Broadly speaking, the aim of the IJBDP is to promote open access research that may advance our understanding of the development of the mind, as a function of biological and genetic, social, or otherwise cultural influences. The scope of articles for consideration include those of an empirical, theoretical, and historical or review nature. Please note that the International Journal of Biological & Developmental Psychology levies a paper-processing charge on all accepted papers. Most open-access journals rely on author charges to offset the costs of managing the journal. The International Journal of Biological & Developmental Psychology encourages authors to include supporting data sets (if applicable) in an appendix at the end of the paper. Do not submit data as an additional file. 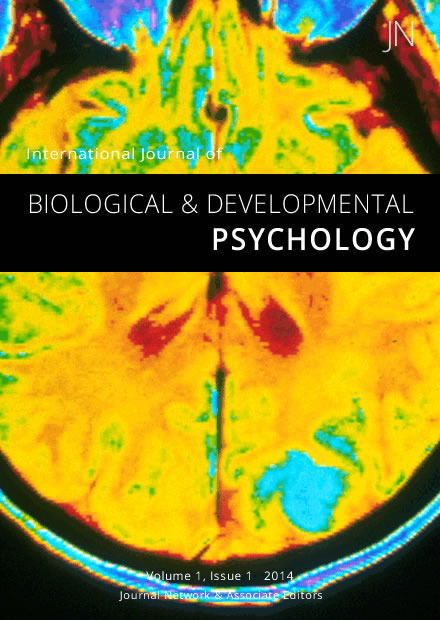 The International Journal of Biological & Developmental Psychology is based on a model of instant distribution, editorial transparency, and continuous peer-review. A submitted paper undergoes a two-stage referee process. The purpose is to minimize time delays between submission and publication, and to promote ongoing conversation and paper refinements between authors and reviewers. The International Journal of Biological & Developmental Psychology is indexed by Google Scholar, and are registered through Ulrich's Serials Directory. ISSN/SISSN numbers are listed for older library systems. We do not offer print subscriptions at this time. Qualified scholars are encouraged to become an associate editor of the International Journal of Biological & Developmental Psychology, and help review submissions. You must have a background in the field to qualify. Full professors, associate and emeritus professors, researchers, graduate students, professionals, and others are welcome to apply, but the decision will be based upon the curriculum vitae in your profile. You will be notified by email when new submissions to the International Journal of Biological & Developmental Psychology are published.